These lovely hoofed creatures are amazing additions to any Halloween look! 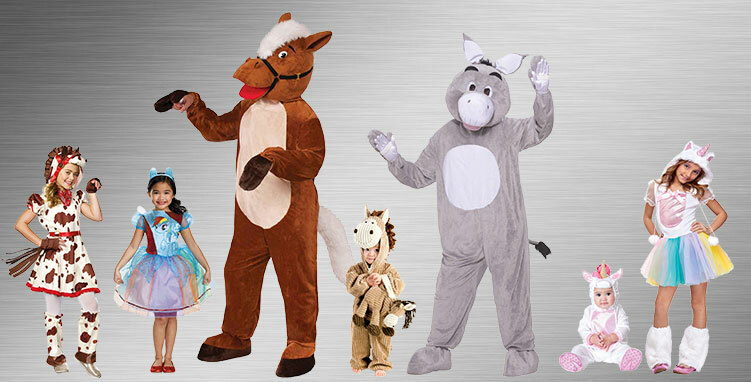 Whether you want to become a two-person horse with a friend for your Halloween costume, or a child wants to dress up as a beautiful rainbow unicorn for a night of trick-or-treating, you're sure to find the looks you'll love with Horses, Ponies, and Unicorns Costumes! 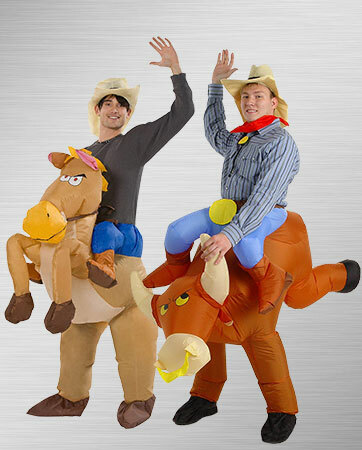 Giddy up and get going to your big costume hoedown. Whether you are racing there or taking a leisurely stroll, this get-up will have everyone at the shindig smiling from ear to ear. Pair this up with your favorite cowboy or cowgirl and make it a priceless duo. This is even a great costume for a school mascot during pep rallies. At this price, a costume this elaborate is hard to find. And that, Partner, is straight from the horse’s mouth! Everyone can appreciate the story of wonder, friendship and acceptance that My Little Pony promotes. Your little girl will soar with joy when she puts on this Twilight Sparkle costume. This character is everything a little girl dreams of. Twilight transforms from a unicorn to a princess and is one of the most beloved ponies in all of Equestria. With her style, grace and bubbly attitude, your little girl will be delighted to play her part all night long. Yee haw! Ride ‘em cowgirls and cowboys! Come galloping into your birthday bash like it is the Wild, Wild West. Lasso yourself a sugary treat and get this party started. 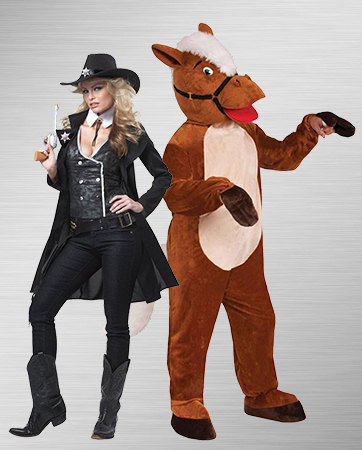 With this plush pony costume you can saddle up with your favorite western apparel and jump right into the rodeo. The costume is easy to put on and easy to move in. Simply step into the hind legs and use your reins to control the front, just like you would when riding a pony! 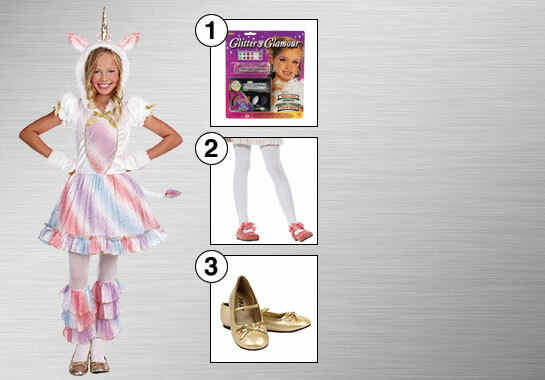 Let your imagination run wild as you get all dressed up in this majestic unicorn costume. Nothing is quite as magical as seeing a unicorn in person. None of your friends will believe their eyes as a stunning unicorn princess struts into the celebration. With a vibrant energy and sparkling attitude, this costume will be complete. Just remember to always wear your smile and nothing can stop you from having the time of your life. Get the whole herd together for a wild party that is full of wonder and magic. Your little ones will be eager to gallop around in their sparkling costumes as they plan to spread smiles and laughter throughout the room. Symbolized by the unique cutie marks, each pony has a distinct personality and something amazing to bring to the table. With all of their strengths combined, this herd of My Little Ponies proves to be a beacon of light that is sure to brighten up the atmosphere at any costume celebration, whether it is Halloween or a theme party. Saddle up! These costumes are sure to take you for the ride of your life. Whether you want to take your chances as a bull rider or have all eyes on you for the rodeo, you can hop on and get going. These illusion costumes will make your friends do a double take, then they will be on the ground laughing. Just be sure to keep a hand on the reins so you don’t hit the ground during this wild ride. If you have wrangled yourself a date for the party, you may as well go as a couple in costumes with matching themes. But don’t worry guys, that doesn’t mean it needs to be a cheesy pair or a couple from a romantic comedy. Have fun with the costumes and let her get sultry while you get silly. Every good cowgirl needs a loyal horse, so offer her a leg up and giddy up all the way to the costume party. Transport yourself to a land of fairy tales with your best friend in hand. 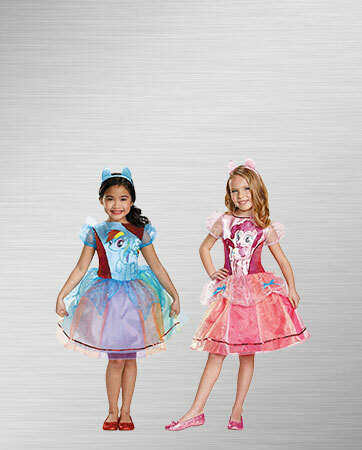 This enchanting duo is the perfect pick for a magical costume party. As a majestic unicorn and a dainty woodland fairy, you will turn myths into reality. You will dazzle everyone in the room with your stunning beauty and playful costumes that will make you want to dance the night away. 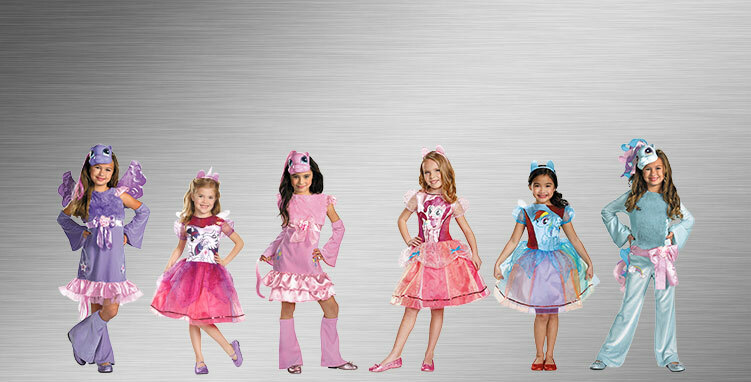 If your little ones love My Little Ponies, they will be head-over-heels excited to get dressed up in these stunning costumes that will make them feel like the princesses they truly are. As Pinkie Pie, your little girl will roam around the party as the social butterfly she is, spreading laughter and joy. And by her side, Rainbow Dash will be flying high and making all the gray skies turn blue. It’s not easy being magical. It takes more than a wave of wand to be transformed into the world’s most elusive creature. Get everything you need to be a majestic unicorn in one easy place. While you may have the big picture figured out, the accessories will really make you shine. Sparkle with gold slippers, keep cozy with opaque tights and let your brilliant smile light up the room with glitter makeup to add the fairy-dust touch.